Brothers John and James Abrams are fourth-generation musicians that deliver a virtuosic blend of familiar country, bluegrass and gospel favorites to crowds around the globe. 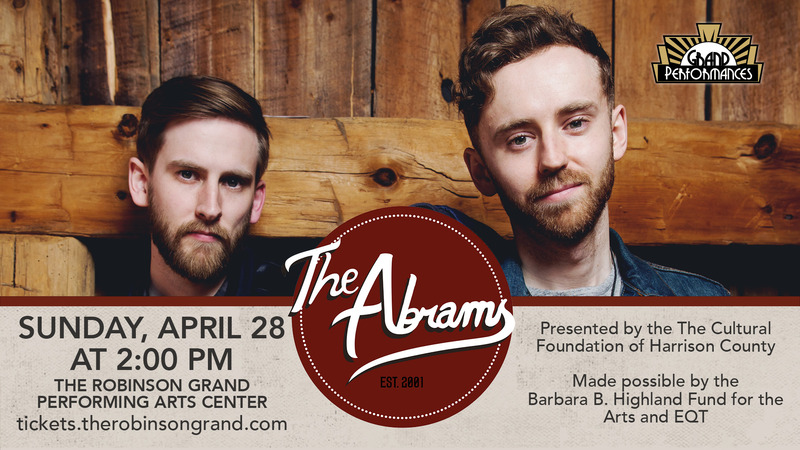 The Abrams will bring their high-energy live performance to the stage of the Robinson Grand Performing Arts Center in Clarksburg, WV on Sunday, April 28, 2019, at 2:00 pm. The Abrams performance is presented by The Cultural Foundation of Harrison County as part of the 2018-2019 Grand Performance Series. The show begins at 2:00pm, with doors opening at 1:00 pm, general admission seating. Support for this music is provided by EQT and the Barbara B. Highland Fund for the Performing Arts. For more information and tickets, visit https://tickets.therobinsongrand.com.